Access into and out of Ft Chaffee whether East or West bound for the lightest traffic is as follows. Take I540 on the East side of Ft Smith to AR-59 southbound. Take AR-59 to AR-22 southbound. Both left turns. Continue down AR-22 to Ft Chaffee's main gate at 1st Ave. Look for the cannons on the right. The gate has limited clearance so be prepared to move to the right side. Once through the gate continue to a 4 way stop. Turn right on to Fort Smith Blvd. During business hours continue to the RV check-in on the right between 3rd and 4th. If you arrive after hours or Saturday/Sunday stop at the security office at the SE corner of 2nd Ave. Once checked in continue to 4th Ave. (Mahogany on Google) After check-in, continue West and turn left on 4th Ave. Go South past the PX and 22nd St on your left. 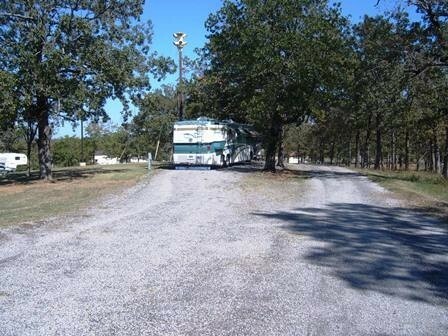 Immediately BEFORE reaching 23rd St on your left, turn right onto a small dirt road to the RV Park entrance. ---- WARNING: This small dirt road is NOT MARKED. If you are driving a big rig, be sure to swing wide to make the right turn onto the road that leads to the RV park because you have to negotiate a rather narrow culvert turning off of 4th St. 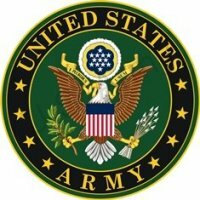 Active, Retire, Reserves, National Guard, DOD employees, 100%DAV, Guests. Located on a hill side overlooking a small lake. Some sites are only 20/30 Amp, some sites are only 20/50 Amp, and some sites are only 50amp electric. Be sure you have adapters. Close to Ft Smith Wal-marts, restaurants, lots of historical sites. Firearms not allowed in the RV Park. Keep them in your RV. DO NOT use GPS cords to the RV gate it is no longer open. You must enter from the main gate. It is a very old base and it shows. But with that being said, the campground is nice and quite. The host came out to meet us when we arrived and was very helpful. There is a nice COE park/campground just a few miles from here if you find this one full. We would definitely stay here again. This was a wonderful surprise. Initially reserved 2 nights, loved the area so much we stayed 5. 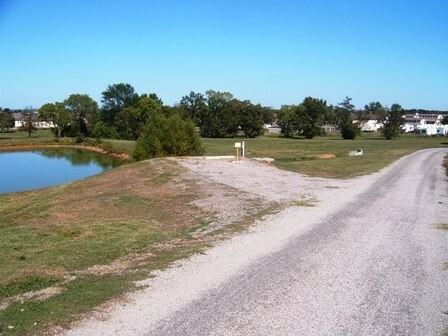 The RV Park is so relaxing and has wonderful hilltop view of the pond & adjoining golf course. The surrounding area is full of history, from The Civil War to present times. We had no idea this place even exists, but we will make it a regular stop on our travels. Love, Love, Love. Very nice small campground. Easy in and out. We were in one of the 2 large pull through sites. Site was up a small hill, level and nice views. No issues with the full hook ups. No WiFi, but for the price we couldn't complain. Very friendly gal in the check in office. Had there been more to do in the area we would have stayed longer than 3 nights. Nice little campground. Only suggestion is to put up a sign at the road leading to the campground. Coming in after dark was tricky. Definitely worth coming back to. I won't go into detail about what others already wrote. Enter base at the light on Fort Road. Camping check in: Right at first stop sign....building on right. Closed the weekends. Active duty $8.50; others $11.30, a night. Entrance to campground not signed. Main campground entrance is at 35.31624 094.28039; alternately (might be easier for some) 35.29810 094.29362. PX 35.30043 094.29607. Showers and bathrooms only at the gym, next to rv check in. NOT open weekends; make reservation over the phone or ask at the gate. Free laundry across parking lot from rv check in. This is a great place to stay. You can't beat the price, and the scenery was awesome. As in previous reviews the roads were a little rough but passable. I'll definitely be back. 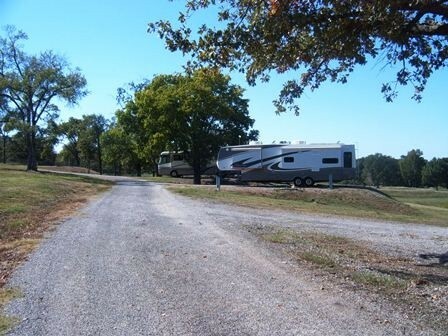 Great little RV park near Fort Smith. Roads were a little washed out and rough for larger rigs but not impassible. Nearest dumpster is at the Dining Facility. Great bang for the buck. We had no hook up issues as in previous reviews/years ago. Haven't seen a review here in a while so I thought I would add the perceptions of my wife and I. We arrived late afternoon and after passing easily through the gates we found our way to the campsite. Our reservation was clearly marked at the site. It appears all sites are easy to get in and out of. After sitting up our camper we went down to his stork Fort Smith to tour the sites owned by the National Park Service. Very interesting plus a very safe place To get him an extra couple thousand steps, got to keep up with the fit bit don't you know. We are using in a frame pop up camper and are lacking a toilet facility in our rig. We do have a honey bucket however. In the morning after breakfast we drove to the gymnasium about 3/4 of a mile down the road to use their showers and other facilities. One plus is the easy access to interstate 40 though it is about 10 miles away. At least you don't have to fight city traffic. We would certainly stay again. If you want to stay in the Ft Smith area to see the historic sites or to visit the area casinos, this is a great place to park your unit. There are several "residents" but there are plenty of open sites. Previous reviews spoke of issues with the water source, particularly on site #10. Great news! They updated the water source, brought it above ground, and made it keyless. If using your GPS when leaving the RV park, don't forget there is only one way in and out of Ft Chaffee, all other gates/roads are closed. For the price and the military security, we would certainly stay here again. The weird water connections are the biggest problem at this Famcamp. The office people state that they are working on getting them taken care of. Some leak all the time and some are rusted shut. You still need the key to turn the water on and off. The camp is quiet and clean. There are no shower or laundry facilities. You do get used to the speakers playing taps (at 10:55 PM and 11:00 PM), reveille (at 7:00 AM) and when the flag is lowered (5:00 PM). The speakers are right in the center of the campground. But for $8.50 a night it is a great bargain. The town of Fort Smith is just down the road with all the big stores and restaurants. 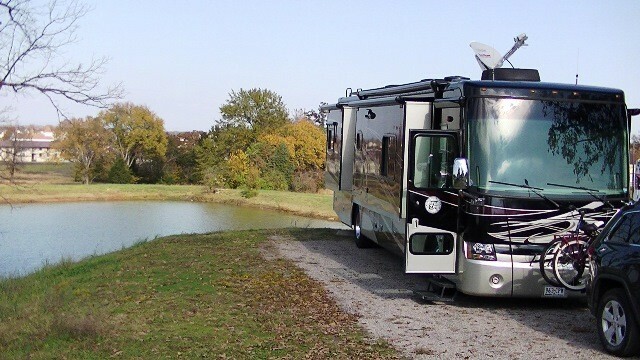 We stayed in a motorhome and will return when in the area. Like many earlier reviews.....a great value for $8.50.....but I have a real issue with the water connections. The site #10 water box would not turn on with the "key" provided by the billeting office, but the camp host had a 4 way key that worked. He suggested running some water before hooking up my hose, which I do all the time, but.....with the connection below the level of the box top I had to connect my hose to the connection that was under water. Seems like a very serious.....potential....safety hazard of safe water supply. Tried the PX. Great price for ice, but no 2 liter soda and no milk at all. Guess that's what keeps Wal Mart in business. I also strongly agree with the review about going into the park from the north...off of I-40. Take exit 3 off of I-540 and go south on Hy 59 to Hy 22, then left turn for just a mile or so to the main gate. Quiet little park. A little more rustic than most military campgrounds. Sites are large but not necessarily level. We drove behind the gym and billeting with the camper and parked beside billeting when signing in. They were very friendly. Very FEW 30 amp sites. I guess you can buy a converter in town for about $25 but have never had a need for one in the last 6 years of camping. The water was at ground level and you need a special tool to turn it on. Luckily our neighbor had purchased one (original purpose was to turn on gas in a fireplace). They may also have one at the office if they are open. No garbage as mentioned before. We found the Elvis Haircut Museum at Fort Chaffee. Small but VERY informative about the history of the place. Enjoyed the free tour of Miss Laura's in Ft. Smith which serves as their visitor's center. After hearing so many good things about this RV Park, we made a side trip to spend the night here. As said before, a no frills RV Park in a quiet location. A GREAT value - what a military campground should be. Although there's a few long-term residents, their RV sites were not trashy. There were a few vacant sites available. We arrived without a reservation. If we had the time, we would have been glad to spend a month here. 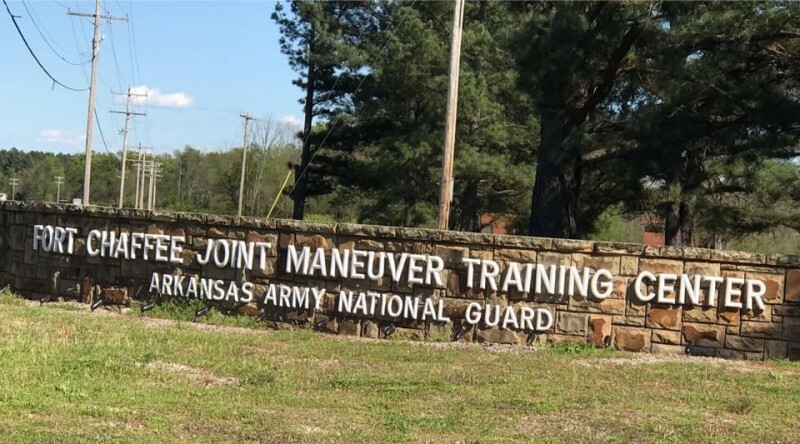 There's a good article on this website about the RV Park and Fort Chaffee. We learned a few things from that article. We didn't know there was "Elvis" history here. Ft Chaffee is an Army National Guard post. Park is WELL WORTH the ~$10 (including tax) per night. Weird setup for water connection...faucet is at ground level. Have a screwdriver handy to lift the sewer lid. Very few pull-thru sites. I had site #2, a back-in site with great shade trees. Nice view of the fishing/duck pond from my garage door patio. Park driveway is one block past the PX. 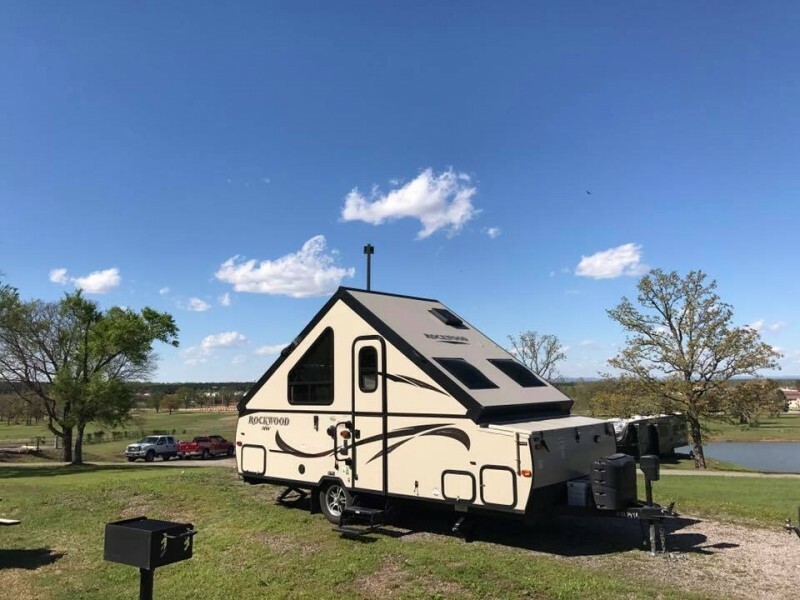 Other reviews said the campground entrance could be a little difficult to turn into, so I pulled into a gravel driveway prior to the "real" driveway and drove thru to the campground. No trash dumpsters in the park, so drop your trash in the dumpsters behind the dining facility. Wifi is available at the gym. There seems to be several fulltimers staying at the park. We came in late and checked in with the MP office to see if a site was available. They took our information and told us to take any site that was open. There was several sites free but other campers were parking their extra cars in them. There was one site open. Electric, sewer, and water is all they offer. No bathhouse or restrooms. The water requires a key but the one on our site was warn so we had to purchase one at Lowe's. Good location, nice PX for a small post like this. People were friendly. We stayed two nights. Loved hearing the range, did not hear it in the camper. Good location. Great little campground. It's clean and quiet. Talked with the people over the phone they set me up for an over-nite stay. There's no extras. Just plain pull-in full hook-up and stay. It was close to town so I could pick up items I needed. I was in site 7 and it did have a great view. It's a little off the beaten track but as has been said before for $8.50 a night you can't go wrong. Came in via main gate (now open again). It is best to call ahead for reservations. Must stop at the billeting office to sign in, they will assign you a spot. Directions to the FamCamp are clear until you get to the entrance. You can see the campground on the left but it is not marked where to turn into it. It is a small driveway next to an unmarked building. Once you do turn into the correct drive be careful, narrow drive, you will see the road up the hill to the sites. There are 37 back-in and 2 pull through sites. 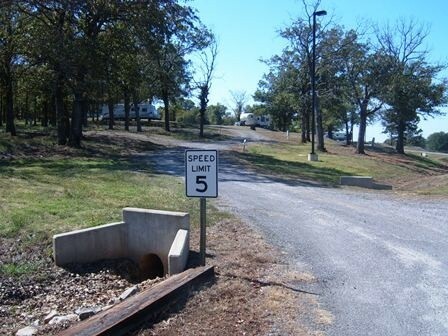 Site #7 at the top of the hill, is a pull through was long enough for my 72 foot length (motorhome & trailer). Great view from there overlooking the Post, a small lake and the golf course. At $8.50 it is a great value. There are a few things that need to be changed on the website. 1st the main gate was closed, had to use the road just before you come to the main gate. Don't know why. We did not have a reservation and billeting was closed but the gate guard knew who to contact which was the Mil police. That building was just across the intersection. I filled out the paperwork, got the key to turn on the water,and the guard escorted us to our spot. He said we were lucky as there was a spot left. However when we got to the CG there were only 4 campers there, so I'm not sure how that works. The CG has water, electric and SEWER, but no bath house. Northern Ar had a big snowstorm come through the day before we got there and there was snow on the ground and 20 degrees outside. The water was frozen. You can't stop Mother nature. We got 12 channels on the TV, and just settled in for the night. For $8.50 a night you can't beat it. They are planning on building a bath house. We will be back. Stayed here for a couple of days to take a break from traveling for a PCS. First of all the coordinates are reversed, I actually figured this out on my GPS beforehand--the GPS coordinates are to the GATE and the GATE coordinates are to the actual campground. Second, unless you are using an RV specific GPS you will want to avoid listening to your Garmin. It took me down to Highway 22 off of I-540, exit 8b. DO NOT go this way coming from the north. Take exit 3 to Hwy 59, then left on Hwy 22. You will avoid bad roads, awful traffic and about a dozen stop lights. After you get to the main gate, Hwy 22 and 1st Ave, the rest of the coordinates and directions are good. Now for the review. This place is nothing fancy but if you want quiet and out of the way for a few days this is the place. The kids and I fished the pond and caught several good fish. No one is around except for a couple of homesteaders. I had site 7, a 50 amp pull-thru at the top of the hill with nice shade. Consider going backwards into the site for a better view. Golf course close by if you have a toad. You can also go into town on Hwy 22 for Wal-Mart, Lowe's, food etc... I would not recommend this place for an overnight stop but if you have a few days it is quaint, quiet and relaxing. A great place to recharge after a long drive. K.H. left this review using the Directory software: Outstanding stopover campground. Beautiful large sites available. Big rigs will have little difficulty as long as you plan ahead for the turn off of 4th Street onto the RV Park pathway. L.H. left this review using the Directory software: The coordinates entered above are for the main gate. 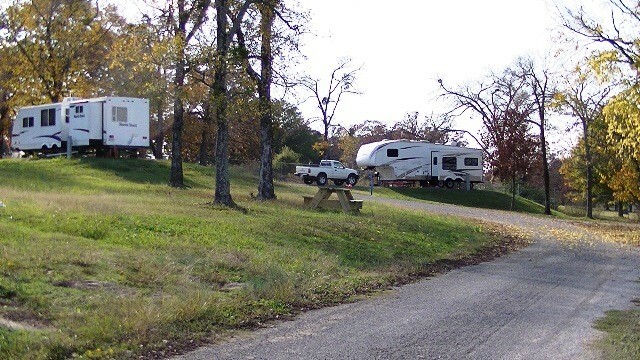 If you are going to the on-base RV park you need to enter through the main gate and go to billeting. 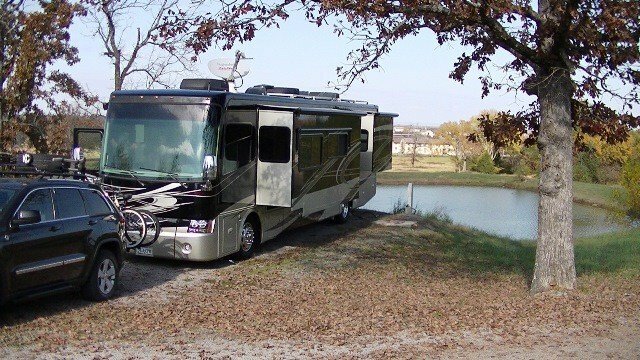 The coordinates on the web site are for the RV park off-base. I ended up there first following the web site coordinates. It (the RV pk off-base) is kind of trashy, short on eye appeal, and appears to be mostly long term occupants. The RV Park on-base was WONDERFUL!!! The staff at billeting that checked me in were pleasant, helpful, professional and great to do business with. Price is best value I've ever encountered. (Editors note: the coordinates have been corrected to reflect the main gate).